Dion Boucicault was the son of Anne Darley, a sister of the mathematician George Darley. It is possible that he was a son of the scientific writer Dionysius Lardner, who lodged with his mother after she was separated from her husband. Lardner supported him financially until 1840. He was educated in Dublin and when he was thirteen he went to University College School in London. He also studied for a year at the University of London before he left to start an acting career in Cheltenham under the name of Lee Moreton. He joined the cast of William Charles MacReady and he debuted next to Benjamin Webster at Bristol. Soon he started to write plays himself. 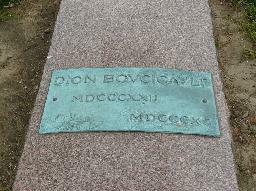 His "A Legend of the Devil's Dyke" was performed at Brighton in 1838 and "London Assurance" was a succes at Covent Garden in 1841. Many more plays followed during the 1840s. On 9 Jul 1845 he married the wealthy French widow Anne Guiot at the Parish Church of St. Mary Lambeth, Surrey. He claimed that she died later that year during a mountaineering accident in Switzerland, but there was evidence that she lived until 1848. He returned to London around 1849, spent his wife's money and went bankrupt. He managed to attract the interest of Charles Kean, who employed him as dramatist in residence. His adaption of Dumas' "The Corsican Brothers" was a huge succes and Queen Victoria saw it five times. In 1852 he impressed the public with his part of Sir Alan Raby in his own play "The Vampire". When Kean discovered that Boucicault had a relationship with his young ward Agnes Robertson their collaboraton ended. In 1853 Boucicault eloped to America with Agnes. He married her in New York by a formal declaration. They had three children who all became actors. Together with Agnes he toured the USA, where they resided until 1860. In 1859 he became the co-manager of Burton's New Theatre (formerly named Laura Keene's Varieties) on Broadway and renamed it into the Winter Garden Theatre. There he performed in his succesful anti-slavery play "The Octoroon". Soon afterwards he left the Winter Garden Theatre and together with his wife he joined hands with actress and theatre manager Laura Keene. With her he staged "The Colleen Bawn". Those who hoped for a rivalry between Laura Keene and Agnes Robertson were disappointed: they joined the stage and got along very well. Back in England "The Colleen Bawn" was staged at the Adelphi Theatre and it was a huge succes. It was performed all over the United Kingdom and the USA. Thomas Jefferson asked him to adapt Washington Irving's "Rip van Winkle" and this was an enormous succes in 1866. In 1876 his son Willie was killed in a rail accident. His marriage with Agnes had broken down and he went back to New York to live with Katherine Rogers. Agnes filed for divorce in 1880, but Dion claimed they had never been legally married. After three years Agnes dropped the case. In 1885 he appeared one more time in London in "The Jilt". Later that year he married the 21 year old actress Louise Thorndyke during a tour in Australia, probably still of the opinion that he had never legally married Agnes Robertson. In 1886 Agnes filed for divorce again and this time Boucicault accepted because he was very happy with Louise. He was forced to sell many of his copyrights to be able to pay for the divorce that was finalised in 1888. By that time his plays had gone out of fashion and he was once more pressed for money. Albert Palmer, the manager of the Madison Square Theatre, helped him by starting a drama school that was run by Boucicault. After his final play "A Tale of a Coat" failed he sank into a depression. After an attack of pneumonia he died in 1890 in New York City and he was buried in Mount Hope Cemetery in Hastings-on-Hudson, north of New York City. Louise lived for another 66 years before she was buried beside him in 1956. 11/10/1841 US Premiere of "London Assurance" by Dion Boucicault in New York. At the Park Theatre. Charlotte Cushman played the part of Lady Gay Spanker. 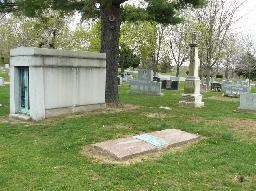 The grave of Dion Boucicault and Josephine Louise Thorndyke at Mount Hope Cemetery, Hastings-on-Hudson.